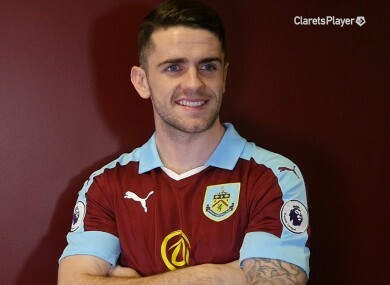 Record signing Robbie Brady is likely to make his bow for the Clarets. PERHAPS THE BIGGEST game of the weekend is Saturday’s early kick-off between leaders Chelsea and third-placed Arsenal. Currently nine points ahead of their fellow Londoners, the Blues can effectively end the title hopes of Arsene Wenger’s men with a victory. When the sides met back in September, it was the Gunners who prevailed 3-0 but Antonio Conte has since switched to a back three and it is working a treat — they’ve won without conceding in seven of their last ten matches at Stamford Bridge since the change in formation. Ireland’s Euro 2016 hero Robbie Brady made a return to the top flight on deadline day as Burnley set a new transfer record to bring in the Dubliner from Norwich City. The wide man links up with childhood friend Jeff Hendrick and fellow Ireland team-mate Stephen Ward at the Clarets and could make his debut away to Watford on Saturday with midfielder Steven Defour sidelined through injury. Dead-ball specialist Brady has four goals for the Canaries this term, and we’re taking a punt that he will begin life at his new club with a goal. There’s a relegation six-pointer at Selhurst Park with bottom side Sunderland visiting Crystal Palace, who are three points better off in 18th. The game also sees Eagles boss Sam Allardyce face the club he rescued from a similar position this time last year. The Black Cats are the second-lowest scorers in the Premier League (20) behind Middlesbrough (19), while Palace have been unable to find the back of the net in three of their last five league outings. West Brom and Stoke sit side-by-side in the top half of the table and meet at The Hawthorns with Baggies boss Tony Pulis taking on his former employers and recent Potters signing Saido Berahino coming up against the club he left in the January transfer window. We’re going for draws in that one as well as in another of the Saturday 3pm kick-offs — West Ham’s trip to St Mary’s to play Southampton. Manchester City can move back into the top four on Sunday but they host a rejuvenated Swansea City at the Etihad. Since the arrival of new manager Paul Clement, the Welsh club have two wins from three in the league — including an upset away to Liverpool. But City had a return to top form on Wednesday as they dismantled West Ham, with a youthful front trio of new arrival Gabriel Jesus, Leroy Sane and Raheem Sterling looking particularly menacing. Email “Brady with a debut goal for Burnley and the Premier League bets to consider”. Feedback on “Brady with a debut goal for Burnley and the Premier League bets to consider”.